The utility had admitted liability in the case and a jury was impaneled to determine the couple's damages. 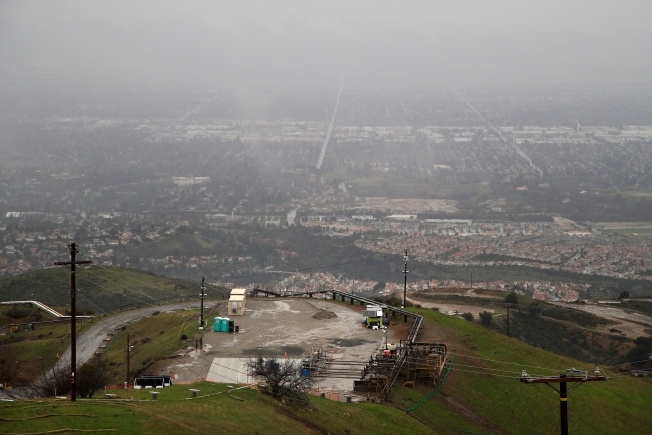 In this Jan. 12, 2017, file photo, a tarp covers the SS-25 well where the 2015 gas leak occurred at the Southern California Gas Company's Aliso Canyon storage facility near the Porter Ranch neighborhood of Los Angeles. An Air Force captain who suffered catastrophic injuries after being struck from behind while on his motorcycle in 2017, then dragged the length of one and a half football fields by a Southern California Gas Co. truck, will receive $46 million under a settlement reached by the parties Monday. The case was resolved prior to the verdict in the punitive damages phase being announced in the 27-day Los Angeles Superior Court trial of the lawsuit brought in March 2017 by Jason Lo and his wife, Nina. The jury had previously awarded the couple $41.8 million in compensatory damages. The utility had admitted liability in the case and a jury was impaneled to determine the couple's damages. Nina Lo sued for loss of consortium. "The winner in this case is the civil justice system, which again proved that disputes can be resolved by 12 members of the community," Lo attorney Brian Panish said. "The Lo family will live with this tragedy for the rest of their lives. The settlement reached by the parties after the jury's substantial verdict will enable this young couple to move forward, build a family and get Captain Lo the medical care he will need in the future." The couple's other attorney, Dan Dunbar, said Lo "has served his country honorably and deserves nothing less than being fully compensated for the horrific injuries he suffered. The jury's verdict makes it clear that they agreed." Lo was riding his motorcycle in Hawthorne about 6:40 a.m. on Feb. 17, 2017, and stopped at a red light when he was struck by a SoCalGas Co. truck driven by a company employee, Dominick Consolazio, the lawsuit stated. Consolazio said he had suffered a seizure immediately prior to and during the incident, according to the suit. Lo and his motorcycle were pinned beneath the truck, with his right leg forcefully pressed on the ground under the weight of the motorcycle, the lawsuit stated. After the initial impact, the truck came to a stop in the intersection for about 23 seconds, the suit stated. Consolazio then began driving again, making a left turn and driving toward a freeway on-ramp, dragging Lo more than 400 feet beneath the vehicle, according to the lawsuit. Consolazio was stopped by good Samaritans, who blocked his path and he was arrested at the scene. The jury found that Consolazio acted with malice, oppression or fraud, opening the door for punitive damages to be assessed against him, but the parties then reached the $46 million settlement. Lo suffered massive, near fatal injuries to his right leg and lost nearly 40 percent of his blood, testimony showed. He was hospitalized for nearly a month with orthopedic and vascular injuries to his leg that required multiple surgeries in an effort to avoid amputation. Lo's leg remains severely disfigured and skin and muscle from other parts of his body have had to be removed in an attempt to rebuild his damaged limb, according to the lawsuit. He faces multiple additional surgeries in the future and amputation of his right leg remains a threat that must be monitored for life, the lawsuit stated. Despite knowing of his epileptic condition, including his admission to suffering 10 prior seizures, Consolazio continued to drive, the lawsuit stated.